Fellow: There is no additional charge to an HNS member, beyond the $50 per year rate for a Professional Member. Once you click submit you can pay for your membership with either a PayPal account or a credit card. You don't need a PayPal account to complete this transaction. If you prefer to pay with a check and mail it to us click here. 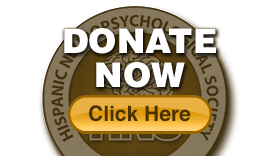 Fellow Members: A Professional member in good standing for at least five years who has made a significant contribution to the science and/or practice of neuropsychology as it relates to the Hispanic/Spanish-speaking individual or community is eligible for nomination to Fellow status. Fellows are recommended to the membership committee, which then acts on the recommendation. Professional Members: Evidence of completion of academic coursework in assessment and/or remediation of neuropsychological conditions and hold a doctoral degree in psychology or an M.D. in neurology with specialization in neurobehavior from an accredited university or medical school. They shall have worked in a setting where such knowledge is applied for a minimum of 3 years, 2 of which must be postdoctoral. Professional members must hold a license or certificate to practice at the independent level in one’s state or province. An international member is required to hold the terminal degree that allows the individual to practice as an independent practitioner in his or her country. International Members: Individuals are required to hold the terminal degree that allows them to practice as an independent practitioner in their country. Associate Members: Individuals who are interested in neuropsychological issues pertaining to Hispanic or Spanish-speaking population and hold a terminal master’s degree in psychology or a related discipline and may or may not hold a license for independent practice are eligible for Associate status. This category also includes those individuals who hold a doctoral degree in psychology or a related discipline but do not meet criteria to be a member at the Professional level. Student Members: Individuals enrolled full or part-time in a course of study leading to a graduate degree in psychology from an accredited university are eligible for Student status. Persons working on their post-doctoral hours are considered student members. This includes international student members. Affiliate Members: Individuals whose training and experience preclude them from other levels of membership, yet are interested in neuropsychological issues pertaining to Hispanic/Spanish-speaking individuals and wish to be formally associated with the Society may be Affiliate members. These individuals do not have formal/professional training in psychology or neuropsychology. They may be interested lay individuals. Academic Partners: Psychology or related programs of study/training programs with an interest in expanding the field of Hispanic/cultural neuropsychology, in general. Corporate Partners: A corporate member shall be a business interested in the field of Hispanic/cultural neuropsychology. Corporate members may note this status in their publications only so long as they do not represent this membership as indicating any form of quality assurance or endorsement, approval in any form of their activities, or as any indicating of the special status of their activities or programs.